When diagnosing wheel lockup, one item you’ll want to inspect is the brake proportioning valve. The brake proportioning valve is used to balance front and rear brake loads during periods of hard braking. When the weight of the vehicle shifts towards the front of the vehicle during the quick deceleration of hard braking, the rear wheels have a tendency to lose traction. The proportioning valve is able to reduce pressure to the rear brakes to prevent rear wheel lock up when the brakes are heavily applied. The proportioning valve is usually mounted near the master cylinder. Brake pressure supply lines are routed from the master cylinder through the proportioning valve, to the calipers or wheel cylinders. Some brake system designs will incorporate the proportioning valve into the master cylinder outlet ports, to the rear wheels. 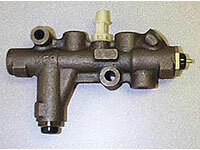 This style of proportioning valve is most often used on split diagonal automotive hydraulic brake systems. The metering valve is used on disc/drum combination brake systems to control front brake lock up during initial braking. The metering valve delays front brake operation to allow the rear brake lining to come into contact with the brake drum. When the brakes are first applied, the rear drum brake lining must first overcome the tension of the return springs before they contact the surface of the brake drum. This can delay the application of the rear brakes for a fraction of a second, causing brake imbalance during periods of light braking. The combination valve contains a proportioning valve, metering valve and the brake pressure differential warning switch combined into one unit. The operating principles of the proportioning valve and metering valve are the same as described earlier in this article. The pressure differential warning switch provides a ground for the brake warning switch, in the event of pressure loss in one circuit of the brake hydraulic system. Refer to a manufacturer’s manual covering your particular year, make, & model vehicle before engaging in an auto repair job involving the correction of wheel lockup. 6 Comments on "Brake Proportioning Valve"
Reading about the proportioning valve is most interesting because I have a recurring brake problem.After the old calipers locked up I replaced them.Can a new combination valve cause front brake pads to rub the discs? i have very poor braking, hard pedal, good vacuum, could it be a prop valve problem? i have front disc and rear drum on a 66 gto front disc off a s-10. i can stand on pedal and still just rolls to a slow stop! does anyone know the manufacturer of the valve shown above. It looks just like the one I have. Mine is leaking at the rubber gasket shown on the far right which I believe is some sort of pressure relief outlet. I have disc brake in the front of the car and drum in the rear. My vehicle is a 1949 Ford and this valve would not have been original equipment.